Tomb Raider revitalized the adventure genre when it was first released on the PlayStation in the mid-90s. Click here to play! Now, it has entered the world of 5-reel bonus slots, bringing its iconic heroine Lara Croft to explore treasure filled catacombs and rescue valuable artifacts of forgotten cultures. Thrill as Lara bounds across deadly pit traps. Be amazed at her staggering intellect as she solves puzzles seemingly created by madmen. Puzzle at the breadth of her morals as she kills endangered species after endangered species that she has walked into the territory of. Lara Croft is a complex woman - hero to archaeologists and bane to animal rights activists. 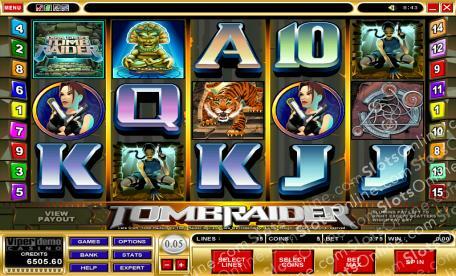 Prepare for adventure and watch the shapely Lara Croft find you a fortune as you play the Tomb Raider slots. With intricate puzzles, golden idols and fierce tiger symbols, you'll experience the excitement of being an athletic Tomb Raider in the comfort of your own home. The Twin Pistol Lara Croft symbol is a scatter symbol, that awards 10 free spins when 3 or more symbols are scattered across the reels. Wins are tripled during these free spins. The Lara Croft Tomb Raider Logo symbol is wild and substitutes for all symbols other than scatter or bonus symbols. The Golden Idol symbol triggers the Tomb Bonus when 3 or more are on an active payline. In it, you select a number of Golden Idols, each awarding a prize value that is added to your payline wins.